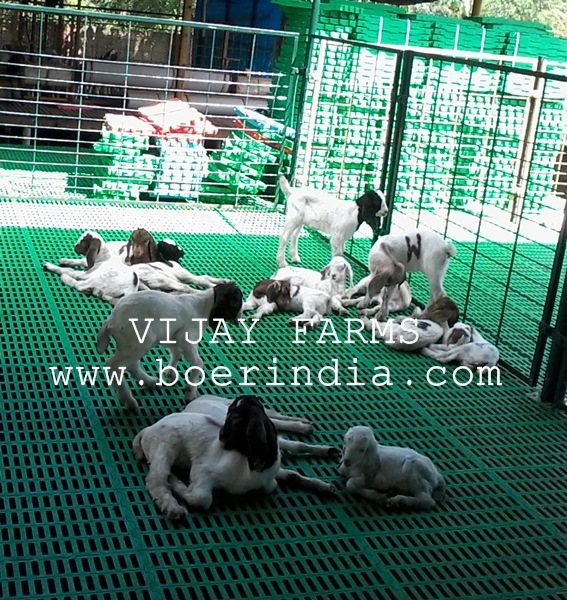 Largest Boer goat breeder in South India! Boer goats are known worldwide for its fast weight gain and high quality meat. In India it is limited in number and mainly used to cross breed with local breeds to yield excellent cross-breeds. We can arrange for supply of plastic flooring, FRP support structures, feed trays and other accessories for shed construction. 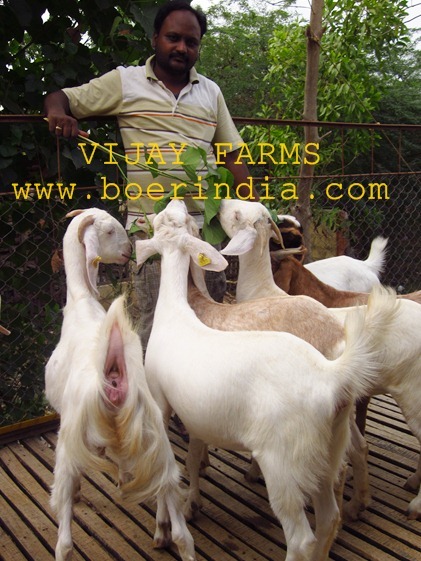 Premier goat breeders in south India. Our mission is to produce high quality, fast growing and genetically superior goat breeding stock. We try to stay at the cutting edge on new practices. 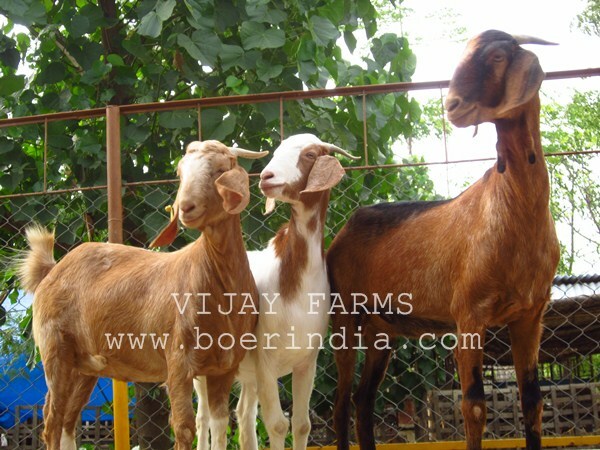 Vijay Farms was founded in 2006 with a mission to be pioneers in identifying and developing best goat breed that is suitable for conditions prevalent in India. Through these years we have learned our lessons (sometimes the hard way!) and have created processes/practices/tools that will help optimize the profit margin while managing the financial and operational risks inherent in this business. We provide an Excellent Parent stock supply in goats (Talacherry and Boer breeds). Supply of excellent quality plastic flooring at a great price. This flooring is custom designed for goats. 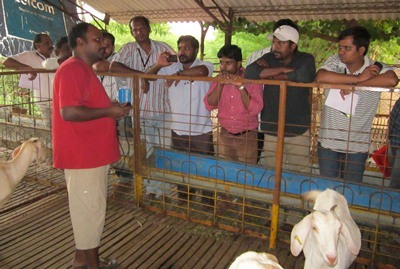 In-farm training in commercial goat farming. Click here for more details. We provide Computer software solutions for goat farm management and profitability calculations. 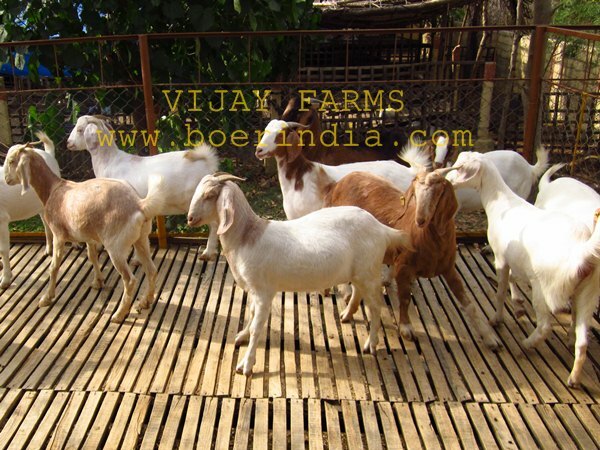 We give Complete consultancy to start a stall-fed goat farm. We also sell and manage goat farming equipment. Wondering where to start and what to do? You are not alone! We have learned it the hard way and will be glad you teach the tricks of the trade. Trying to decide on starting a goat farming business and wants to understand the big picture, economics, success factors, pros and cons of the business, and wanting to make a go or no-go decision. Already decided to start a farm but wants to gain invaluable experience from people who have already gone through the learning curve. Running a goat farm but wants to enhance the profitability and operational excellence. What breed shall I choose? It is a common question and dilemma. We believe we have found a good answer for that question; based on our experience we suggest that a parent stock of Thalachery does along with Boer bucks in 50:1 ratio works very well. In this Method we can optimize long term profit while keeping the initial investment reasonable. Thalacherry goats (Also called as Talacherry, Thalacherry, Talacherri, Thalacherri, Tellicherry, Tellicherri, Tellicheri, Talacheri, Thalacheri, Malabari) have many advantages. We welcome visitors on two days per week. We provide a tour and explain various aspects of goat farming. Indian economy is growing at a great speed and the demand for food is increasing exponentially. Goat meat that used to be a luxury for most of the population is becoming affordable to a larger number of people due to economic growth. This has caused an increased in demand for mutton in India and not enough supply to meet the demand. This demand cannot be met by traditional method of small scale backyard goat rearing in villages. Goat farming is a business that has seen tremendous growth in recent years.